Then again, I might wait for the 10inch version. Don’t get me wrong, the iPhone is an extraordinary device which changed everything just by taking what people had been struggling with over the last few years and doing it right, but it’s time to move on. Waving goodbye to all the cash I’ve spent on apps which will be useless if I don’t stick with Apple is just something I’ll have to live with. Which is why I can’t wait for the iPad competition to come out. I’m also still in love with my Asus Eee 901, but the netbook is such an inelegant and slow way of doing the things I want a tablet for that more often than not if I want to check Twitter or cross reference something I’ve just seen on TV, for example, I’ll end up using my phone instead. Two pieces of news have got me excited this week, then. 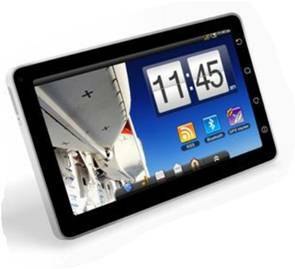 The first is that Viewsonic is unveiling it’s 7inch tablet contender (above), based on Android, at IFA 2010. It’s called the ViewPad 7 and has all the usual 3G, GPS and Bluetooth gubbins, but importantly has the USB port that the iPad lacks. If only it had an HDMI out too. The second is that Canonical are coding multitouch support into future versions of Ubuntu. As promising as Android is as a platform for tablets, I’m not so sure I want Google to rule the web any more than I trust Apple with that role.